Mixing is performed in this turbulent mixer through a three-bladed impeller and the placement of two rods to disturb flow. The model also considers the shape of the free surface. 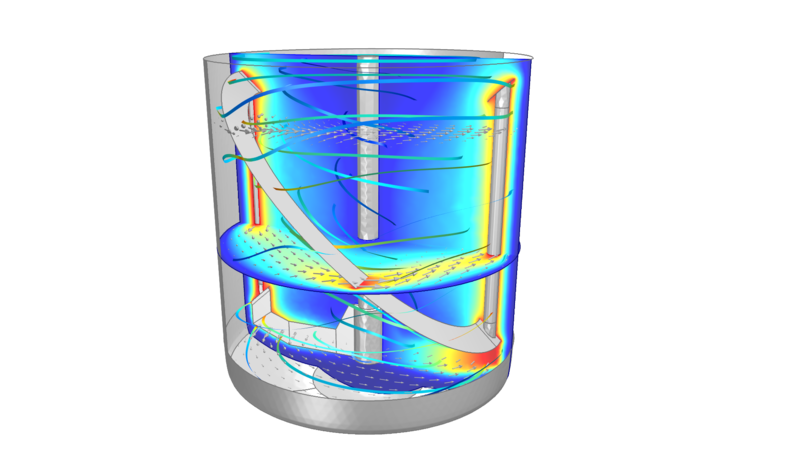 As an add-on to the CFD Module, the Mixer Module allows you to analyze fluid mixers and stirred reactors. Aided by dedicated functionality for simulating fluid flow subjected to rotating machinery, the Mixer Module also provides material data for modeling different fluids and free surfaces. Mixers with rotating parts are used in many industrial processes, such as the production of consumer products, pharmaceuticals, food, and fine chemicals. Often, a mixer may be used in batch processes for many different purposes, even on a day-to-day basis, where products are produced at low volumes and sold at high prices. One thing all mixing processes have in common is that quality, reproducibility, and uniformity of the products is of utmost importance. One way of making sure that these product requirements are met is to perform simulations in order to design and optimize the operation of the mixing process and the mixer itself. Models and simulations are particularly useful when they can be validated by a pilot process, and then be used for scale-up computations. Once validated, such models may be used to avoid the costs involved in building and running pilot scale processes, and instead go directly from the lab scale to full-scale production. NON-ISOTHERMAL MIXING: Model of a fluid that is mixed and heated using the Rotating Machinery, Non-isothermal Flow interface. The slice plots indicate the temperature field and the arrow and ribbon plots the direction of flow. BAFFLED MIXER: Streamlines and velocity magnitude in a cross section of a dished bottom baffled mixer with a four-bladed impeller. The color scale on the baffles represents the pressure, the slice plot shows the modulus of the velocity vector, while the streamlines show the direction of flow. FROZEN ROTOR: The frozen-rotor feature is used to simulate the mixing of a non-Newtonian fluid. This feature can be used in mixers without geometric hindrances like baffles as it requires far less computational resources. Chemical and fluid mixing may be required for a variety of purposes that include mixing species, such as to promote chemical reactions in batch and continuous stirred tank reactors, or to enable a steady dissolution, crystallization, precipitation, absorption, or extraction process. Rotating machinery-based mixers contain an impeller and a vessel design that can include components like baffles. These components are usually readily available, and your choice of impeller and vessel will depend on the intended process. Often, impellers are interchangeable and are used for different fluids or mixing requirements in the same vessel. The Mixer Module contains flexible and robust physics interfaces for modeling fluid flow affected by rotating machinery. This includes a specific one for laminar flow, which is used for modeling mixing flows of low to intermediate Reynolds numbers by solving the Navier-Stokes equations. It can do this for incompressible and weakly compressible flows (up to Mach 0.3), and also contains features that allow for simulations of non-Newtonian fluid flow. The physics interfaces applicable for modeling turbulent flow as affected by rotating machinery do so by solving the Reynolds-averaged Navier-Stokes (RANS) equations for the averaged velocity and pressure fields. Three turbulence models are available and include the k-epsilon model, the k-omega model, and the Low Reynolds number k-epsilon model. The k-epsilon model often provides a good compromise between accuracy and computational requirements while the more computationally-demanding Low Reynolds number k-epsilon model is more accurate, especially when resolving the fluid flow close to walls. The k-omega model also delivers more accurate results, particularly in recirculation regions close to walls, although it is less robust than the k-epsilon model. Similar to the physics interface for laminar flow, incompressible and compressible (Mach < 0.3) flow can be simulated in turbulent flows. Non-isothermal and buoyancy-driven flow occurs when a fluid is affected by temperature gradients. The Mixer Module contains physics interfaces for supporting this. The Non-Isothermal Flow interfaces provide predefined functionality that fully couples the temperature and flow fields while also allowing for the simulation of the flow affected by rotating machinery up to Mach 0.3. Also included within these interfaces is the ability to model the heat transfer in fluids and solids. Rotating Machinery, Non-Isothermal Flow interfaces are available for both laminar flow and turbulent flow, utilizing the turbulent models described previously. Density and composition variations in flows affected by rotating machinery can also arise due to chemical reactions. The Mixer Module contains a physics interface to support such reacting flows. This interface automatically couples the fluid flow equations with the mixture density, as it is solved by the Transport of Concentrated Species interface. Reacting flow as governed by rotating machinery can be simulated assuming turbulent flow, using the turbulent models described previously, as well as assuming laminar flow. Choosing the right physics interface to use often depends on experience, experimental results, or other qualitative analyses. Excluding relevant physics leads to the wrong results, while including all possible contributing factors often leads to excessive computation times. The Rotating Machinery interfaces available in the Mixer Module aid you in setting up simulations of varying complexity. If the species being mixed do not affect the fluid that is holding them, then a modeling approach can involve solving for the fluid flow, and then the material transport using the velocity field as an input. Concentrated mixtures, reactions, and thermal variations will often affect the constitutive quantities, such as density and viscosity, of the fluid. When these effects become appreciable you can switch to the Rotating Flow, Reacting Flow interface or the Rotating Flow, Non-Isothermal Flow interface, respectively. Taking it one step further, COMSOL lets you add other physics interfaces, such as one that describes structural mechanics, to the preexisting ones to customize your simulations. The Mixer Module contains a series of physics interfaces that are based on the laws of the conservation of momentum, mass, and energy as well as species material balances in fluids. Different combinations and expressions of the conservation laws, applicable to the relevant physics of the flow field, result in different equations and settings that can be accessed through the built-in physics interfaces available in the Mixer Module. These physics interfaces allow for advanced simulations with rotating machinery acting upon fluids. This includes laminar and turbulent flow, incompressible and weakly compressible flow, as well as non-Newtonian flow. Additional physics interfaces are available that include terms and equations to describe the effects of temperature, reacting species, and free surfaces on the fluid flow equations. 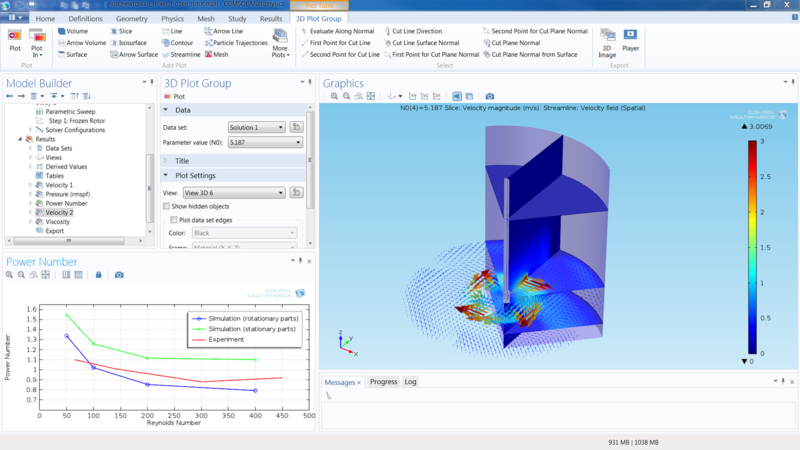 The physics interfaces for these types of flows allow you to simulate, in 2D and 3D, time-dependent models that account for a full description of the rotation of the impeller, or through using the frozen-rotor approximation. A fully time-dependent study for fluid flow affected by rotating machinery accounts for the movement of the geometrical parts relative to each other, and is the most accurate way to simulate mixing processes. COMSOL defines a modeling domain that encompasses the impeller or rotor, and another outside of this where the walls and artifacts like baffles are found. It then uses sliding mesh technology to account for the integration between the two domains. The accuracy provided by this solution process is a necessity when the modeling of the start-up conditions of mixers is to be investigated. Often, though, this method is computationally expensive when the desired result is to simulate how the mixer will perform after a period of time, and during normal operation under pseudo steady-state conditions. The Mixer Module also supplies a Frozen Rotor feature that assists in saving computational resources and time. 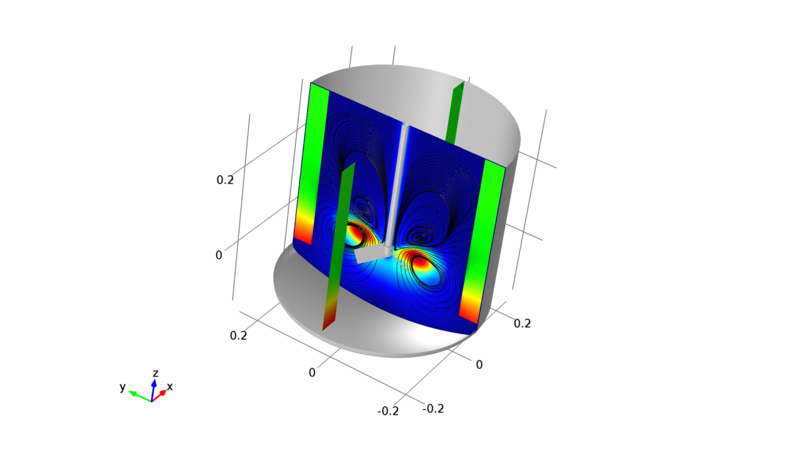 This feature simulates rotating flow by assuming that the topology of the system relative to the rotating reference frame is fixed, or frozen, and significantly reduces the computational resources required to simulate the pseudo steady-state condition. Using this feature is equivalent to solving for the stationary Navier-Stokes equations where centrifugal and Coriolis forces have been added to the rotating domains. Utilizing the frozen-rotor approximation is appropriate for mixers without baffles or other hindrances, or where the entire system rotates, such as centrifugal separation in microfluidics. Yet, when systems are geometrically such that a full description of the rotor's rotation relative to the stationary parts is required, such as a baffled mixer, the Frozen Rotor feature can still be helpful in reducing computational resources and time. While it may not reach the exact solution in such geometric configurations, use of the Frozen Rotor feature will still provide a decent approximate solution, where its quality depends on how close the frozen and stationary components are to each other. Then, by using this solution as the initial velocity field and other parameters for a transient simulation, the fully time-dependent study will reach its pseudo steady-state conditions in far less time. The Mixer Module provides specialized functionality for modeling free fluid surfaces in mixers. This functionality allows you to include the effects of surface tension forces and contact angles between the free surface and the walls. Using moving mesh technology, the Mixer Module allows the free surface's shape to be simulated by letting the contact line between the fluid being mixed, the fluid above the free surface, and the solid surfaces of the walls and rotor to freely move along the solid surfaces.